We're getting into the 100 degree+ weather here in Phoenix, many of our members are asking "What's a cool carrier for the hot summer? ", because of it's breezy possibilities the mei tai was chosen as the COTM for May. Demonstrating this month is myself, Rachael, and my daughter who is 15 months old and around 23 lbs. We are using the Infantino Wrap & Tie, it's very similar to the Infantino Sash that you can find in local stores. There are many variations of the meh dai, it was originally styled after traditional Asian baby carriers. All of the variations feature a rectangular body and four long straps. The one we are using for the photos has padded, straight straps. Other variations may have wide "wrap style" straps, cinching bodies to accommodate small babies or various hood styles. They can be made from simple canvas or cut from woven wraps and many fabrics in-between. This month I will be demonstrating front and back carries in a meh dai, so you can try either or both and post pictures for the raffle. Begin by finding the shorter, waist straps and tying around your waist. I'm tying it at the top of my hips because my girl is taller now. You can tie higher at your natural waist or where ever is most comfortable on your body, so long as when baby is in place and secure you can kiss the top of their head easily. For a smaller infant you can also roll the waist band to shorten the body panel before tying onto your waist. Secure behind you in a double or square knot. Be sure not to tie this in a bow as the loops can catch on things and cause your carrier to come loose. Bring baby up to you in a seated squat position. While holding baby with one hand, reach down and pull the body panel up over baby's back. If you pull up on both shoulder straps you can bounce baby down into the seat and make sure none of the body panel is stuck under her. Bring the straps over your shoulders and cross them to form an X on your back. Bounce gently and pull to tighten as slack. 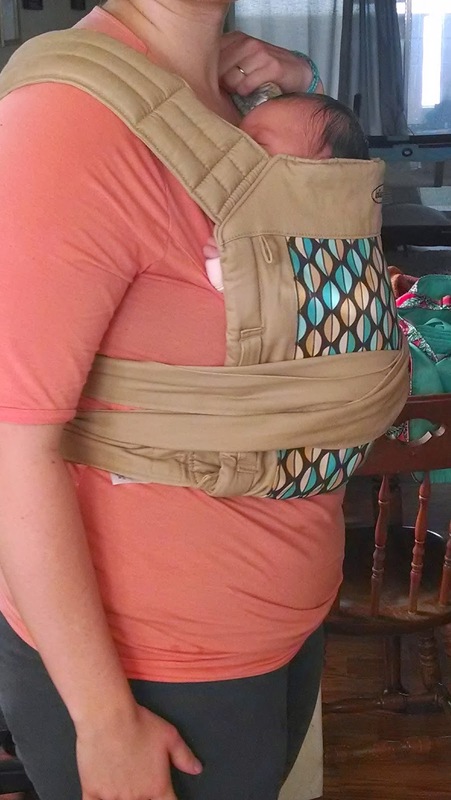 Bring the straps forward at your sides, over baby's bum, and under the opposite leg. This will form another X over baby's bum. Bring straps behind you and tie in a square or double knot. With a small infant, I tied the waistband higher, at my natural waist "apron style" with the waist strap flipped up to form a pouch for baby. I have her legs in the carrier in the tree frog position with her weight resting on her bum and not her legs. The straps are crossed over her bum and then back behind me to close the gap of the sides of the carrier. Use your preferred method of getting baby up on your back. I used the Superman Toss, another method is the Hip Scoot. While keeping baby secured with one hand/arm, reach down and pull the body of the carrier over baby's back and one shoulder strap up over your shoulder. Switch the hand that is securing baby and pull the other shoulder strap over your shoulder. Bring the shoulder straps together and pin them between your knee to hold tension in the straps. This will allow you to check that baby is centered in the carrier and that all the straps are smooth and not twisted across you and baby. Keeping one shoulder strap pinned between you legs, work with the other strap. Bring it under your shoulder, across baby's bum and under the opposite leg. Bring the tail of that strap back to the front and pin between your knees or thighs. Switch straps and work with the other shoulder strap in the same manner. The straps will now form an X over baby's bum. Bring the straps to the front and tie in a double or square knot to secure. Baby is up and you're free to move around! An option if you find the backpack or "Ruck" style straps uncomfortable is to bring the remainder of the shoulder straps up and thread them back through.This will pull the straps in and take some of the pressure off your shoulders. Before you tie off your shoulder straps, keep one side pinned between your legs. Work with the other side by bringing the strap up diagonally across your chest under the strap at your shoulder. Repeat the step with the other strap. Bring the two ends together and knot them at your chest. If you're a women this works as sort of an outside bra which can either be good or bad! Regardless of looks, some caregivers find this more comfortable. The prize for the month of May is a whole pack of goodies! 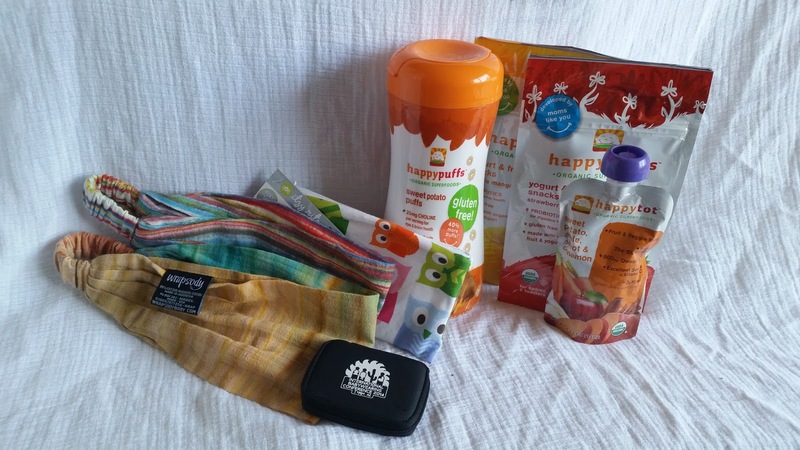 Various treats from the Happy Family company, two Wrapsody headbands, a reusable snack bag from Itsy Ritsy, and a sewing kit from our very own International Babywearing conference 2014. 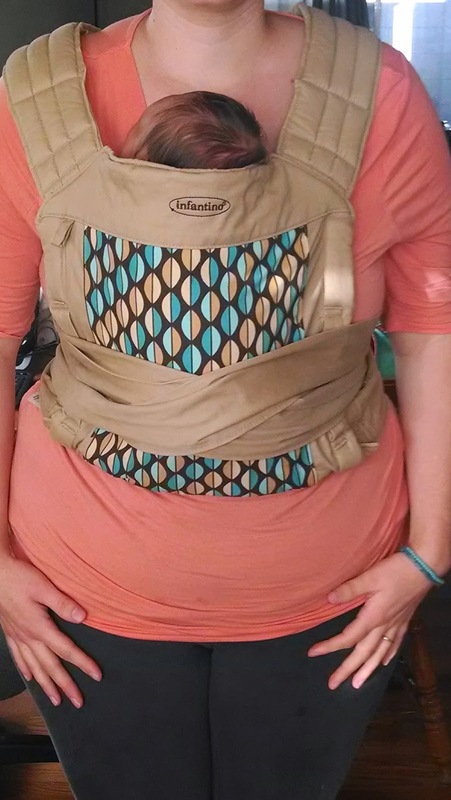 To enter to win, simply post a photo of you trying out a front or back carry in a Meh Dai on the COTM thread in our Facebook group, if you're not on Facebook email your entry to us at PhoenixBabywearers@gmail.com. At the end of the month we will draw a winner. To earn additional entries, you can post a new picture of you trying it out every day. Go forth and Meh Dai! March 2017 Note: This post has been edited. This carrier style used to be incorrectly referred to as a Mei Tai. We are using the correct terminology now as recommended by the statement at #NotYourPodBuTai. You can read the statement here and Babywearing International's statement in support of this statement here.